What is the major advantage to an occlusive dressing? The biggest advantage to using occlusive dressing on a wound is that the wound becomes as isolated from the environment as possible. 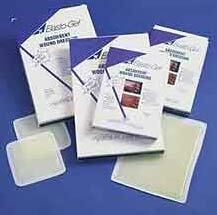 The idea behind blocking or sealing the wound is to prevent any type of contaminant from entering the wound. The entire purpose of the occlusive cover is to stop air, specifically oxygen, bacteria and possible pathogens from accessing the wound and the healthy periwound tissue. The reason that some wounds need to have air to heal and some need to be kept moist has to do with the type of wound and the size of the wound. Typically larger wounds that will take longer to heal need to be kept moist during the process to prevent drying of the edges of the wound. During this time infection is a huge concern, so occlusive dressings provide the perfect solution. Occlusive dressings can also be used with antibacterial ointment and other medications to hold the medication to the wound or skin's surface, avoiding loss through contact with other surfaces. Can occlusive dressings be used with large wounds? Occlusive dressings can be used with very large wounds. Originally these dressings where commonly used in cases where the lungs had been punctured to prevent the loss of pressure in the chest cavity as respiration occurs. Other major injuries such as stomach wounds or wounds to the lower back are also contained at least initially with occlusive dressings in first aid treatments. What other types of dressings can be combined with occlusive dressings for wounds with moderate to high exudate? Since occlusive dressings are non-absorbent they are often combined with hydrogels, hydrocolloid dressings or calcium alginate dressings in low to moderate exudate wounds. The hydrogels, hydrocolloid or calcium alginate helps to trap the fluid in the gel component to continue to keep the wound tissue moist but not allow the exudate to build up and cause the occlusive dressing to slip or slide on the wound. As mentioned above, occlusive dressings are also indicated when topical medications are used on the skin or on a wound. In these cases the occlusive dressing is designed more to keep the medicated ointment close to the wound, not necessarily to keep air away from the wound. Often in this scenario the occlusive dressing is used for a short period of time, not for the full duration of the treatment of the wound. Can occlusive dressings be used on dry wounds? Occlusive dressings can be used on wet or dry wounds depending on the specifics of the wound and the specific reason for the dressing. Since they are largely designed as a barrier, they do need to be checked and monitored to ensure that the wound is healing and the treatment is progressing effectively. Patients should not use occlusive dressing on chronic wounds or deep wounds of any type without the supervision of a doctor, medical professional or a home health care nurse.